After our last brutal trip along the shores of lake Erie we were heading to the Albany airport enjoying views of the Erie Canal and Mowhawk Valley when we caught a glimpse of the old Beechnut factory in Cananjoharie. Pulling off the highway we discovered a mill town intact: an aspect of the project we had not explored. We decided then and there to return. A year later we were back. Canajoharie is the Mowhawk word for “Pot that washes itself”, describing a natural whirlpool below the falls on Canajoharie Creek. Mill Street follows the creek. The houses and mills still standing along the street were in a state of arrested decay giving us a good glimpse into its past and rich material for our brushes. The cluster of old houses at the end of the road we affectionately termed ‘the fishbowl’ was a beehive of continuous activity with old men mumbling to themselves, young adults drinking beer and playing basketball. Weaving through all of it a kinetic stream of jelly-faced kids on razors, bikes and little tikes bright plastic vehicles. Day one we were treated to a tour of the Arkell Museum by Sue Friedlander (of Collections) who gave us some history on the town and of the museums chief benefactor and Beechnut visionary Bartlett Arkell. We spent the next five days painting along the creek being informed and entertained by folks who grew up and worked there. The powder coating factory (once a creamery) also canned deer meat for the locals during the depression. The mill where the first flat bottom paper bag was produced. The school where Susan B. Anthony taught. The generations who worked at “the Beechnut”. The Canajoharie Creek. The stone walls everywhere trying to corral and contain the creek and the paramount importance of that waterway in the lives of so many. The physically broken men still at work: former dock builder now grateful to have a maintenance job. The weary, hunched, soot blackened man who passed me each evening from the coating company with a smile at days end. The wholesale kindness and curiosity of the people, and genuine surprise that we’d chosen to document the town they loved. Sometimes unknowingly reminding them of their everyday beauty. 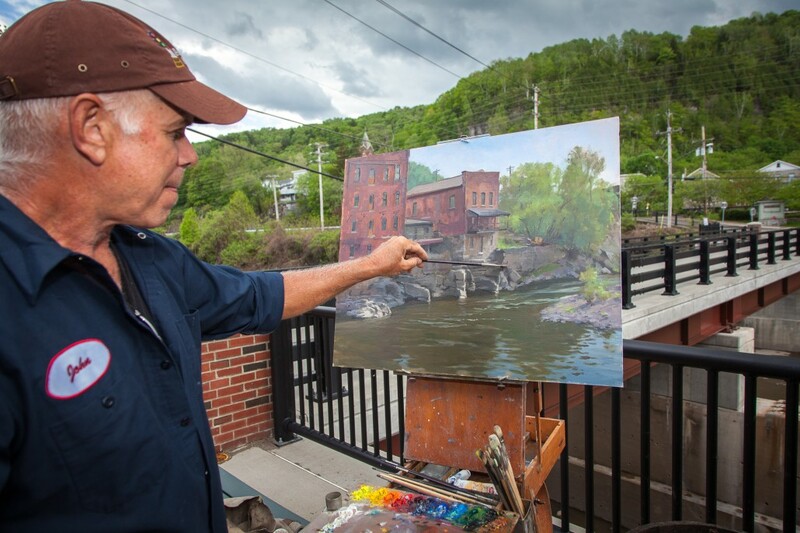 Another mill town built up around water – the Mohawk River and Erie Canal flow through it. Massive stone walls dominate everywhere. Stone workers were lured from Carrara Italy specifically to serve the need. Massive blocks stacked, fitted and pinned with iron, stretch almost across the river and have the forever feeling of Roman ruins. Everything is on a God scale. The message is lasting — permanence and prosperity. However, in it’s present sleepy state, it takes imagination to give scale to it’s former power. The mills produced Flour, Paper, Textiles, Batting, Tools and much more but the town has lost half its population since 1950. At Canal Street, a bridge crosses the Mohawk River. There we were treated to a view of a pair of brick buildings stacked on stone foundations which were stacked on river bedrock. The Bedrock forms were wild and free form. 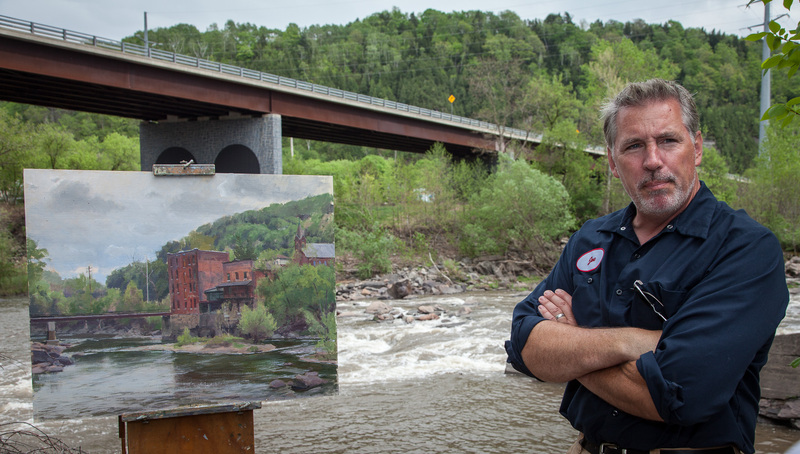 We both realized that this was an iconic image and spent the next three days working on large canvases; John a view from the bridge and me working upriver on a concrete pad near the old hydro-electric plant. It was an unseasonable 83 degrees with brutal humidity. While I was left in blissful silence to work on a secluded concrete pad under the trees John was baking in full sun on the bridge and visible to all passers-by including scads of jelly-faced children and couple of folks who were bent on bringing him closer to God. From a safe vantage point I viewed the delightful pantomime with a guilty pleasure. In this case the road less traveled was indeed the best choice. The following day we painted from the 167 bridge with a great view of the Erie canal looking down on the old South side neighborhood. This was primarily where the Italian stonecutters lived. We ended with a visit to Alan and Linda Vincent who lived in one of the brick buildings we had painted. 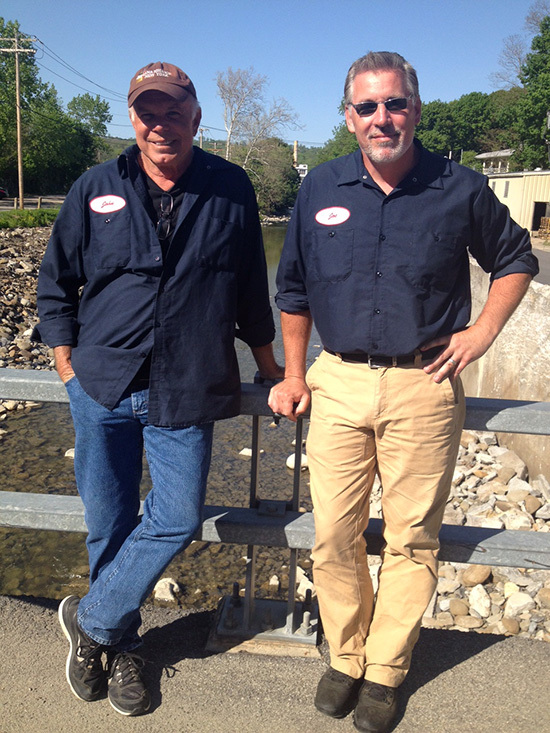 Alan, a third generation mill owner, was handing the business to his son. The old photos and conversation were a fitting way to end our visit and tie together past and present. The great weather made it possible for us to work relentlessly and add greatly to the project. We rented a 200-year-old farmhouse just outside of Canajoharie and enjoyed a commanding view of the Mohawk Valley. While breathing in lilac and a budding world we grilled meat, laughed, had the occasional martini and reviewed the days work. If work gets better, I’d like to know about it. Special thanks to our host Diane, Sue, Kevin, Alan, Linda and all of the folks who welcomed and informed us — bringing us one step closer to telling this American story. Joe Paquet wrote this and I put it together. It’s a pleasure to work on this project with John & Joe, I love the stories they bring back and I get to see the paintings in person to photograph them. I look forward to the day when they have the opportunity to show them all! Joe is traveling today so I don’t know if he will be able to reply soon. I am from the Mohawk Valley area. Lived there for over 40 years in Utica. Words fail me in telling you how wonderfully beautiful it was to see and to read what you did there. I totally agree that the area abounds in beautiful landscapes. I have been following your website and would thoroughly enjoy doing a workshop, especially in the Mohawk valley area. Are there any plans in the future for this? I am currently living in another very picturesque area in north central Maryland. Just 12 miles south of Gettysburg. I thank you for your message and wish you good fortune. (I think your work is outstanding. If you are interested I am teaching a workshop in NY in October. I lived in one of those buildings in Little Falls as a baby. My father owned the brick buildings and ran a bar and restaurant The Roman Grill there (1960s). How wonderful to see them in your beautiful paintings! Thank you for sharing your work. I’m grateful to have had the chance to paint a bit of your history. Cananjoharie is indeed a special place. I inadvertently commented in the wrong place. The concrete pad at the old Powerhouse in Little Falls from which you painted the buildings near Canal Place belonged to my longtime companion, a retired art professor from Oberlin College. He would have been glad that you saw and appreciated the beauty and grandeur of the landscape and architecture in Little Falls. They were among the things that attracted him to the city, and he would have been glad that the pad overlooking the river was where you set up your easel. What a spot and what a town! We enjoyed the people and the place greatly. What will become of the powerhouse? My Grandmother and mom would tell us stories about how Grandpa worked the river and the canal. Gram was a great unprofessional tour guide of Canajoharie and Ft.Plain…High Castle and Low Castle respectively. Beech-Nut started with exactly that; beech-nuts used for coffee when coffee couldn’t be gotten, then when the company could get coffee and when it expanded into candy and baby foods. The Canajoharie Beech-nut in my estimation should never have fallen as far as it did simply because it originated at Canjo. Generations of family worked at Beech-Nut. It was the bread and butter of our home area. My uncles and Aunts worked there, and then some of us kids did too. I can remember my dad out in the fields during pea season and these big machines were out there harvesting the crop. I was just a little kid but I was in awe. That was my first time tasting a fresh pea. It seemed like everything was green for miles and miles and miles….and probably was. An ocean of green. We would fish in the Mohawk. During my Gram and Gramps day they swam in the Mohawk. Gram talked about how they would catch eels out of there and how delicious they were skinned, seasoned, battered, floured and fried in lard or bacon grease….just so you know, my gram lived to be 95. So much use to happen in Canajoharie and Fort Plain thanks to the older folks in part and until the laws started saying that this or that couldn’t be done. Most of the time it didn’t involve anything dangerous but nonetheless the more that was prohibited the smaller the out come of people. It basically boiled down to money as many things do. There use to be boat parades and races on the Mohawk. We could watch the Flying Tigers soar over head. The Fonda Fair down the river in Fonda use to be jam packed and had big name entertainers who sang Country Western, the true Country Western like Patsy Cline, and others. Now at the fair it is but a phantom of what it use to be. I believe it will die out all together in the next 10 years. I am glad you brought back to life, if just for a while thoughts that one gets when they walk down memory lane. I think I’d like to try the eel! Thank you for taking the time to share all of it. When we visit a new town we always do our best to go deep and get to know a place but 10 days is no lifetime. Your words put flesh on the bones of the project.